June 4 Portland Labor Against the Fascists mobilization brought out hundreds. A strategy to fight the deadly danger posed by the fascists must take account of their role in “triggering” state repression. We are not only dealing with the several thousand organized neo-Nazis and Klansmen, who are plenty dangerous, or a few masked buffoons waving sticks, but the more powerful and sinister forces arrayed behind them. The liberal tactic of ignoring these violent racists while relying on the police and demonizing antifa militants only intensifies the danger. The pseudo-socialists who organize diversionary parades far from the sites of the fascist provocations are aiding the government in trying to prevent mass action that could actually drive the fascists off the streets. Militant workers action is urgently needed to bring to bear the power of the proletariat against these provocateurs who would act as a battering ram for the bourgeoisie to destroy the unions and all those who fight against oppression. They can and must be stopped. This call for workers action is not some abstract or unrealizable pipedream. It has begun to be carried out, first in Portland, Oregon1 and now in the San Francisco Bay Area. As always, the key is the intervention of class-struggle militants. In Portland, preparations for labor action against the fascists go back to the motion that was approved by Local 10 of the Painters Union (IUPAT) last November as racist attacks multiplied in the aftermath of the election of Donald Trump. The motion to “Mobilize Labor to Stop the KKK” was put forward by members of Class Struggle Workers – Portland.2 This inspired six other area unions to pass similar resolutions. As a result, when a fascist/racist rally was announced for June 4, the groundwork had been laid for the Portland Labor Against the Fascists mobilization which brought out several hundred unionists from 14 area unions in the first significant labor action against the fascists in decades. In the Bay Area, the announcement of a rally on August 26 by some of the same fascists who staged the provocation in Portland led Local 10 of the International Warehouse and Longshore Union (ILWU) to likewise pass a “Motion to Stop the Fascists in San Francisco.” The union vowed to shut down the port and “march to stop the racist, fascist intimidation.” This call to action was directly inspired by the Portland mobilization, and IUPAT Local 10 sent a message of solidarity to ILWU Local 10. Other unionists and leftists, galvanized by this call by the most powerful and historically militant union in the area, mobilized to follow the ILWU into battle. The fascists, seeing the balance of forces arrayed against them in this union town, felt compelled to run away before the fight had even begun.3 This victory should be a clarion call to labor and opponents of racism and fascism everywhere. Workers mobilization is key to stopping the racist terrorists in their tracks. That requires painstaking preparation, and the relentless exposure of the bourgeois liberals and opportunist leftists who stand in the way of effective antifascist action. In the San Francisco Bay Area in late August, the counterposed strategies were thrown into sharp relief when fascist groups called a weekend of rallies amid the outrage over the murder in Charlottesville. On Saturday, August 26, Joey Gibson of Patriot Prayer called a “Freedom Rally” at Crissy Field in San Francisco near the Golden Gate Bridge. The next day a “No to Marxism in America” rally was called by Alt-Rightist Amber Cummings at Martin Luther King Park next to Berkeley’s Old City Hall. In both cases, liberal Democratic politicians moved to ban the rallies, then ended up promoting “peaceful” events together with various human rights groups and labor bureaucrats to promote “love” over “hate,” and above all to avoid “confrontation.” But others were determined to stop the provocations. In the end, both fascist events were called off. The first and key event was the Saturday Patriot Prayer rally in San Francisco. Democratic politicians including House of Representatives minority leader Nancy Pelosi and SF mayor Ed Lee tried to get the federal Park Service to cancel the rally permit, as the Portland, Oregon mayor also tried leading up to June 4. In the face of the feds’ refusal, the mayor called a “San Francisco Stands United Against Hate” rally at City Hall on Friday (endorsed by the SF Labor Council). A Saturday march was called by “San Francisco Peacefully Unites Against White Nationalists” at the Civic Center, far from the scheduled fascist event. But those events hardly fazed Gibson’s “patriots.” Both would have let the racist/fascist rally go ahead unimpeded. What tipped the balance was the decision by ILWU Local 10 to call for labor mobilization to “Stop the Fascists in San Francisco.”4 This became the rallying point for leftists and union militants vowing to stop the fascist provocation. The Internationalist Group publicized this significant motion and comrades traveled to the Bay Area to help build for an action by the most powerful and historically militant union in the area to shut down the fascists. But there were difficulties in organizing, and a contentious planning meeting four days before the event. Most importantly, Local 10 president Ed Ferris got cold feet, issued a statement saying members could choose what event to go to, and joined the Democrats’ call on the feds to cancel the permit. However, the day before the event, Gibson called off his rally saying that he “felt like it was going to be a huge riot,” specifically citing counterprotesters. He called a press conference for Alamo Square Park, but as antifascist demonstrators mobilized to gather there, he cancelled that as well. 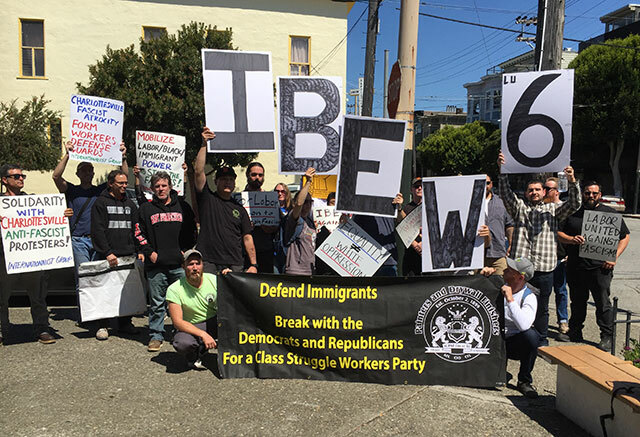 On Saturday close to Crissy Field, IG supporters met a group of workers from IBEW (International Brotherhood of Electrical Workers) Local 6 who had also been inspired by ILWU Local 10’s resolution. Together with a contingent of painters from IUPAT Local 10 who had traveled from Portland to join the antifascist mobilization, IG comrades later joined the IBEW Local 6 activists at their union hall and marched as a small labor contingent to Alamo Square where they were joined by members of the ILWU-affiliated Inland Boatmen’s Union. They were cheered as they arrived, and after some speeches – the last being greetings from the Portland painters – over a thousand protesters held a victory march to the Mission District. In San Francisco, a reformist left coalition, which had planned to join the ILWU march on Crissy Field and then went to Alamo Square after Patriot Prayer canceled, adopted the name “San Francisco Against Hate,” mimicking the mayor’s event. This liberal terminology is a deliberate attempt to obscure the need for sharp class struggle against the fascists. Even Donald Trump could denounce “hate” in his “both sides to blame” whitewash of the fascists. Across the Bay in Berkeley on Sunday, August 27, the reformists went a step further and themselves organized a stay-away-from-the-fascists event under the name of “Bay Area Rally Against Hate.” But despite their best efforts, a big chunk of the crowd didn’t want to stay away and marched to the fascists’ rally site, only to find that the handful who showed up had already been run off by several hundred antifa militants. In the aftermath, the International Socialist Organization (ISO) has tried to credit the “Rally Against Hate,” which it played a large part in organizing, with the departure of the fascists, claiming “Bay Area resistance scares away the alt-reich” (Socialist Worker, 28 August). Other co-sponsors of the anti-hate rally include the social-democratic Socialist Alternative (SAlt), Socialist Action and Democratic (Party) Socialists of America (DSA), the Maoist Revolutionary Communist Party (via its RefuseFascism.org front group), the Communist Party USA and “dozens of unions, student and community groups.” It was a typical popular-front event tying labor and the left to Democratic Party liberals, in this case including the East Bay Young Democrats, Berkeley Democratic Club, Cal Berkeley Democrats, etc. The ISO also tries to make out that the anti-hate rally was counterposed to Berkeley mayor Jesse Arreguin, who got the city council to pass an emergency ordinance allowing the police to regulate demonstrations in the downtown area. But after earlier telling people to stay off the streets, Arreguin ended up printing 20,000 “Berkeley Stands United Against Hate” posters and issuing an August 23 statement urging people to go to the Bay Area Rally Against Hate, among other events. The ISO also neglects to mention that there was another antifascist rally, called by SURJ (Standing Up for Racial Justice), that met at a site closer to MLK Park and which from the outset said it would march to the fascists’ announced meeting place. That march drew several thousand, while others, including antifa and By Any Means Necessary, went directly to the Park. Also present at Sunday’s social-democratic/liberal stay-away–from-the-fascists rally in Berkeley was the Spartacist League (SL) and its Partisan Defense Committee, which had a contingent with banners against the Democratic Party and calling for labor/black mobilization to stop the fascists. The SL had earlier greeted the ILWU Local 10 motion, saying it would join the union in fielding its own contingent on Saturday in San Francisco. However, no such Spartacist contingent was to be seen at Crissy Field or Alamo Square. In its article on the Bay Area events (Workers Vanguard, 8 September), the SL goes on at length denouncing the “Cynical Charlatans of the Internationalist Group” for supposedly helping union bureaucrats “perpetrate” a “fraud.” It additionally takes aim at Jack Heyman, a retired longshoreman who drafted the “Motion to Stop the Fascists in San Francisco” and who has initiated and helped lead militant actions by Local 10 against racist attacks and police terror for decades. The ILWUers “had gone to the hall for work, not to march against the fascists,” wrote WV. The WV article disappears a fundamental fact: the fascist event had already been called off the day before. In our leaflet we wrote that the longshore union should have “taken the next step to bring out the membership in a mass labor-led victory march.” But the reality is that the union leadership called off the march for the same reason the SL didn’t show up with its promised contingent: Gibson had cancelled. The fact is that the SL joined with the ILWU tops in demobilizing. The Spartacist League has made much of a supposed qualitative “retrogression of consciousness” of the working class, in order to justify the SL’s flight from the class struggle. Blinded by its “theory” of abstentionism, the SL can’t fathom that the heavily black unionists of Local 10 who had voted unanimously to stop the fascists would want to celebrate the fact that the would-be lynchers had been prevented from mobilizing for racist terror in their city, and that they had played a key role in this. To label that and the whole effort toward a labor mobilization a fraud speaks volumes about the actual retrogression of consciousness of these ex-Trotskyists. Interesting account. What’s missing in this picture? Nothing about the Spartacist League. Why? Because the SL wasn’t there, while the IG was. So according to WV it was a victory after all. What led to that? The preceding paragraphs call Gibson’s whining about the Democratic city officials whipping up “tons of extremists” against him an “invention.” They note that over 1,000 protesters marched to Alamo Square to confront the fascists. That’s who Gibson was afraid of. And who were they? These were same protesters who had called to march behind the banner of the ILWU. The reality is that the fascist provocation was stopped, that was a victory, and the ILWU’s call to action was key. Our leaflet told the truth, the SL denies it in order to justify their inaction. As for the denunciation of retired Local 10 militant Jack Heyman, a recurring obsession for the SL, WV writes: “The only call to action ever issued to the Local 10 membership was signed by Heyman and an active longshoreman, who called themselves ‘Longshore Workers to Stop the Fascists.” This is a “crime”? So when the union leadership fails to take steps to carry out the motion – not the first time that has happened – union members who seek to mobilize the ranks are denounced as “serving as the bureaucracy’s handmaiden”! The real fraud is the Spartacist League’s claim to be for labor/black mobilization to stop the fascists. The SL’s whole flimflam is a cover for the fact that it didn’t lift a finger to try to bring out the ranks of labor, not then or any time in the last few months. It didn’t even bother to attend the union-called planning meeting. It didn’t show up at Crissy Field or Alamo Square. Its only action that weekend was a contingent at the reformist/liberal don’t-confront-the-fascists rally in Berkeley. The SL is fixated on denouncing Heyman for the same reason he is constantly attacked by the ILWU International tops: because he has over and over sparked and played a leading role in the class-struggle actions by Local 10 that the union bureaucracy has sought to sabotage and that SL supporters in the union have boycotted and bad-mouthed. The SL obsessively attacks Jack Heyman because he is the mirror in which its own abstentionism is reflected. To justify this shameful policy, the serial prevaricators of the latter-day Spartacist League have had to repeatedly lie about, distort or be silent about actions initiated by or participated in by the Internationalist Group and the League for the Fourth International, of which the IG is the U.S. section (and which the SL never mentions). On 24 April 1999, the day after the Brazilian teachers’ work stoppage and in coordination with it, the ILWU (on a motion by the same Jack Heyman) shut down every port on the West Coast for eight hours demanding freedom for Mumia. The union marched in San Francisco at the head of 25,000 people chanting “An injury to one is an injury to all, Free Mumia Abu-Jamal.” The SL’s response was to deride the union action as nothing more than an extended lunch break. It later admitted that its response had been sectarian. Then when on May Day 2008, the ILWU again shut down all 27 West Coast ports calling to stop the war in Iraq and Afghanistan, the SL dismissed this as a flag-waving social-patriotic cover for the Democratic Party and U.S. imperialism. It quoted the words of the ILWU International president who had opposed the walkout, and when he couldn’t stop it, tried to sabotage and then distort it. The SL blithely ignored the fact that the motion calling for this first-ever strike by U.S. workers against a U.S. imperialist war explicitly denounced the Democrats for failing to stop the war. Nor has the SL even mentioned the Portland Labor Against the Fascists June 4 mobilization, initiated by Class Struggle Workers – Portland, which is fraternally allied with the IG. In reality, the SL’s latest hit piece in Workers Vanguard is its desperate attempt at a response to the Portland workers’ groundbreaking action, grasping at straws to excuse its own abstention. There’s a method here, beyond the transparent sectarianism. In each case, the Spartacist League takes the betrayal or sabotage or demobilization by the bureaucracy as an excuse to attack the militants who fought for class-struggle action. The fact that the union misleaders fail to mobilize, that they support the Democratic Party, that they push through sellout contracts only underscores the need to build a class-struggle opposition in the unions, which the Internationalist Group does and the Spartacist League does not – even where they have supporters in the union, as in the ILWU. 5 The SL and its misnamed International Communist League abandoned the Brazilian comrades in 1996 precisely when they were under attack by pro-police elements who brought cops into the union meeting, saying they had to “take their hands out of the boiling water,” quit their elected union posts and leave town. And then the SL/ICL smeared the black Trotskyist militants as “dangerous hustlers” and actively tried to sabotage their defense campaign when police raided their office demanding lists of their members. For documentation, see our dossiers on Class Struggle and Repression in Volta Redonda, Brazil (February 1997) and Responses to ICL Smear Campaign Against Brazilian Trotskyists (May 2010).